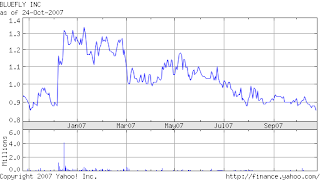 PickleStocks.com: The Insider's Guide To Penny Stocks: Paper Trader: Is Bluefly, Inc.(BFLY) on a path to recovery? Paper Trader: Is Bluefly, Inc.(BFLY) on a path to recovery? BFLY has been on a decline for at least half a year. The truth is, whenever Mr. Soros' own Bluefly falls below $0.90, I have a hard time supressing my excitement to papertrade again. Today, I'm putting down 5000 shares of BFLY at $0.87 ($4350). Why? Why not! Shopping season's coming up.